Narrative: On December 29, 2013 at 8:28 P.M. the Spokane Fire Department responded to an extrication call involving two vehicles at the intersection of Wellesley and Belt. Fire crews arrived within minutes to fine one light sedan and one SUV. There were two occupants in the SUV and three occupants in the sedan. All five patients were checked for injuries, the two patients in the SUV were not injured, the three in the sedan were found with neck and back injuries and after extrication form the car, were transported by AMR to nearby medical centers. Spokane Police were on scene and are investigating. Narrative: On Saturday, December 28, 2013 a little after 9:00 PM, the Spokane Fire Department Dispatch Center received a 911 call for a house fire located at 3017 E. Rowan. Callers reported fire in a single story residence with smoke coming from the eaves and roof of the home. Fire Dispatchers diverted Ladder 2 from a nearby medical call and assigned it to this incident along with 5 other apparatus. Ladder 2’s crew arrived on scene within 3 minutes, reported a working fire and went to work. Command was assumed by a Battalion Chief arriving shortly after Ladder 2. Ladder 2’s personnel verified everyone was out of the home by speaking with bystanders and performing a search of the structure. Engine 8 applied the first water on the fire with the additional incoming resources coordinated into the fire attack. This fire was controlled within 10 minutes of Ladder 2’s arrival, but crews spent several hours removing burned material from the home and checking for hot spots. Fire cause is accidental in nature and appears to be related to a wood stove used to heat the home. There were no injuries at this incident, and one tenant and dog have been displaced by the fire and the resulting damage to the structure. Shortly after 10:47 PM, another fire was reported at an apartment complex located at 6901 N. Wiscomb. Eight apparatus, most having just worked at the Rowan fire were now responding to this incident. Engine 18, the first to arrive, reported fire and smoke showing from the eave line on the north side of the building. Engine crews advanced hose lines to two of the upper units. They found fire in a common wall between the two apartments and in the attic above the wall. Occupants were evacuated, followed by a search of the building’s four apartment units to verify everyone was safe. Firefighters had the fire controlled within 20 minutes, but continued to work for several hours making sure the fire was out. The fire originated in a second floor wall with the cause being electrical in nature. The building sustained fire damage in two of the upstairs apartments and a portion of the attic. One family of 3 has been displaced. Cause: First Fire wood stove. Damage: Rowan Fire: 3 rooms and a portion of the attic. Wiscomb Fire: Common Wall in two apartments and a portion of the ceiling/attic. At approximately 1:10 PM this afternoon, December 11, 2013 Spokane City Fire crews were dispatched to 2722 West Boone on a reported structure fire. Fire crews responding to this location reported seeing a column of smoke showing from several blocks away. The first unit on scene reported heavy fire showing from the northeast corner of a single story, wood framed structure with smoke showing from the eaves. The home was later identified as a 1-1/2 story structure with fire extending into the attic on the north and east side. The first engine arriving on scene initiated an aggressive interior attack confining the fire to a bedroom at the back of the home while a second fire crew attacked the fire in the upstairs bedroom. Additional fire crews on scene completed search, vertical ventilation and salvage and overhaul. The fire was brought under control within 30 minutes. There were no injuries to any civilians, one firefighter suffered a knee injury and was transported to a local hospital for examination. Fire crews remained on scene for several hours completing overhaul and assisting in the investigation process. Avista gas and electric crews arrived on scene and removed hazards as needed. The house was found to be vacant and unsecured however neighbors did report seeing 2 individuals staying within the home the last several days. There was heavy fire damage to a bedroom and bathroom on the north side of the structure on the main floor, fire damage in the attic and heat and smoke damage throughout the rest of the structure. Narrative:On 12/09/2013 at 01:25 hours, the Spokane Fire Department responded 5 engines, 2 ladders, 1 rescue, and 2 battalion chiefs to a reported structure fire at 2004 W Gordon. First arriving SE13 reported smoke showing from the windows on Alpha and Delta sides. After ensuring all occupants were evacuated from the structure, SE13 took a fire attack hose lead into the structure to locate and extinguish the fire. The fire was located in the basement on side Delta. SE13 and SE16 were successful in knocking down the fire and containing the fire to that area of the structure. SL4, SL2 and SE3 assisted the fire attack efforts by pulling ceiling to expose any areas where fire may have extended. There were no injuries to civilians or Firefighters on this response. Narrative:On Saturday, December 7, 2013 at 07:36 AM, an automatic fire alarm was received from 2929 South Waterford, Touchmark on South Hill. As the incident was being dispatched, the Communications Center received information that smoke was visible on the first and second floors. The incident was upgraded to a full alarm and added 4 Engines, 2 Ladders and a Heavy Rescue under the direction of Battalion Chiefs Donahoe and Moline. The first fire company arrived within minutes from nearby Station 11 and reported smoke showing from the eves and second and third floors visible from the Pittsburg side. First arriving firefighters sprinted into action by raising aerial ladders to assist those potentially in need and deployed handlines to aggressively attack the flames while performing a primary search. Additional firefighters were immediately summoned including all three of the CIty's Ladders, to assist battling the blaze as the incident was officially upgraded to a working fire. The 499-unit apartment complex was in compliance with Fire Codes including hard wired smoke alarms, smoke-activated magnetic fire doors and automatic sprinklers in building area, all of which assisted in saving lives and preventing the spread of fire and smoke. This serves as a good reminder for all to never block open fire doors as this allows smoke and fire to travel and impede occupants from escaping in an emergency. One unit was involved in fire in the wall and floor areas and smoke was present throughout the floors. Over 40 firefighters extinguished the blaze in just 35-minutes and there were no injuries. There were no security doors, window bars or obvious non-fire factors to impede the residents from exiting all of the floors. Firefighters are remaining on scene for several hours, assisting the residents and building managers. Cause:The cause is under investigation and facility’s management has done a wonderful job at assisting the residents with temporary accommodations. Damage:The damage is limited to a wall and flooring on floor 1 and 2. Companies are still on-scene and residents will be able to reoccupy within the hour. On Friday, December 6, at approx 8:30 AM, the Spokane Fire Department responded 2 ladders, 5 engines, 1 heavy rescue, and 2 battalion chiefs to a reported structure fire at 1503 E Rich. Neighbors had called in the fire and said they could see smoke and flames coming from the single story family residence. SE15, located in the Hillyard neighborhood, arrived and reported heavy smoke coming from the approx 1500 sq ft residence. After ensuring the occupants were out of the structure, SE15 advanced a preconnected hose to attack the fire, which was located in the basement. Later arriving crews were assigned to secure a water supply, provide openings to remove the smoke from the structure, and advance additional hoses. The fire was extinguished within 20 minutes and crews spent several hours removing burned materials and checking for hot spots. The tenents are being assisted by the Red Cross as their home is uninhabitable. Traffic control was provided SPD units who blocked nearby intersections. The cause of the fire in under investigation by the Spokane Fire Department Special Investigation Unit. The basement was heavily damage with heat and smoke damage throughout the rest of the structure. Well it’s that time of year again! As I write the snow is falling, Thanksgiving is firmly behind us, and the Local 29 Firefighters of Spokane are heading out to share some Christmas Cheer! Of course, I am talking about the Local 29 Spokane Firefighters Union’s Santa Sleigh. The firefighters realize that for many kids, this is their only chance to see Santa. The malls may be too expensive for many parents or the time required to go wait in long lines may be more than they can offer. It is a very big deal, young or old, to see Santa! And while the teenagers may have learned the secret behind the curtain I can assure you the magic is still very much alive! Parents are overjoyed at a chance to shoot a photo of the kids with Santa! We attempt to stop (when and where safe) and hand out candy canes to every child we see. Many kids and parents may wave from the window at first but if we pause they will frequently grab a coat and head out to visit. 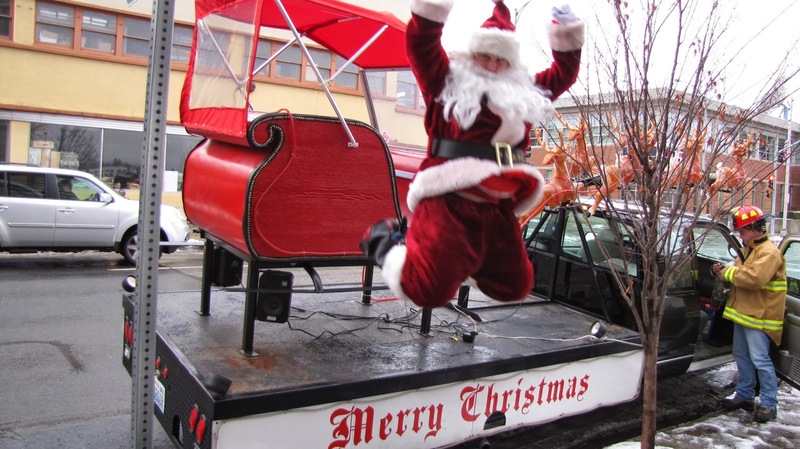 So, if you hear a little Christmas music blaring louder than your typical teen driver it just might be Santa Claus and his elves from your City of Spokane Firefighters Union! And don’t forget to be nice, because Santa’s driving around checking on his Naughty and Nice list and you don’t want a lump of coal on Christmas morning do you? On Saturday November 09, 2013 at 09:55 AM, 6 Companies of Spokane Firefighters, 1 Senior Ladder, 4 Engines and 1 Heavy Rescue under direction of Battalion Chiefs Donahoe and Moline responded to a reported house on fire. The first arriving Engine Company reported heavy fire involvement of a single story wood framed dwelling with potential victims inside. Police Officers were already on scene and attempting to search for occupants near the exits. The Responding Chief at this time upgraded the incident to a working fire adding another dedicated Ladder, an Ambulance and the on duty Fire Investigator. Companies were assigned to extinguish and confine the fire, vertically ventilate the roof and complete a thorough search of the building. No occupants were home at the time of the fire and there were no injuries reported by Firefighters or Civilians. Market Street was shut down for approximately 2 hours and companies remained on scene until 16:00 overhauling the structure. The Red Cross was called to assist 1 adult female and 5 children with clothing and possible shelter requirements. There was extensive fire damage to the kitchen and living room with smoke damage throughout the rest of the home. Exterior fire damage occurred on two sides of the home with damage also to the roof. Narrative:On Thursday October 24, 2013 09:41AM, 7 Companies of the Spokane Firefighters, 1 Senior Ladder, 5 Engines and 1 Heavy Rescue under the direction of Battalion Chiefs Jones and Moline, responded to an Apartment Fire at 6021 North Mayfair . Spokane Firefighters arrived quickly to find smoke showing from the second floor unit of a two- story apartment building. The building contained 8 apartment units total. The first arriving Chief requested an upgrade to a working fire which added another senior Ladder, additional engine and staff from the Training Division. Finding fire in two units and the attic space, firefighters commenced with a fast fire attack and swift salvage operations to protect personal property within the structure. The first Senior Ladder immediately laddered the roof and ventilated above the apartments involved in fire. The well coordinated effort of firefighters confined the flames to the attic and two apartment units. There were no injuries reported from either residents or firefighters. 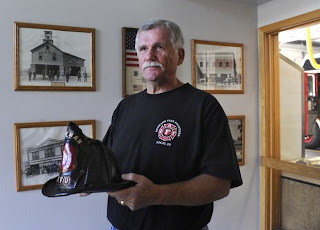 Local 29 Benevolent Fund replaces fire victims' stolen donations and then some. Thad Frater, Local 29 Secretary-Treasurer hands $500 check to Jaaz Salon. 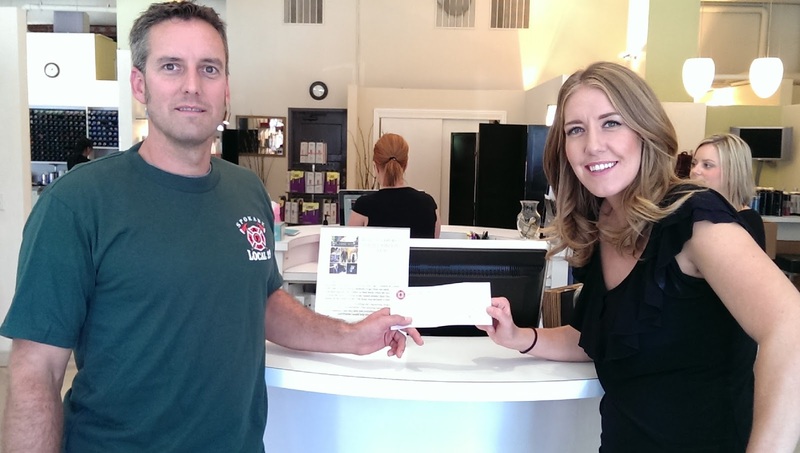 Jaaz Salon had been collecting donations for one of the families that had been burned out of their home during the three-house fire on Sherman and 19th last month. They had collected about $20 so far when it was stolen, according to the Spokesman-Review article. 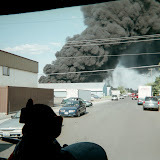 On Tuesday September 10,2013 at 09:59, 8 Companies of Spokane Firefighters, 5 engines, 2 Senior Ladders, 1 Heavy Rescue under the direction of Battalion Chiefs Donahoe and Moline responded to a reported commercial roof fire at E-Z Loader Trailer addressed North 717 Hamilton. The first arriving Chief arrived to find a large 1 story commercial building with a flat roof and light smoke showing out of an air handling unit. The building's responsible party reported everyone was out of the building. Companies were immediately assigned to locate and attack the fire from inside the warehouse while a ladder company placed their aerial ladder to the roof and ventilated the roof surrounding the air handling unit. The fire was quickly knocked down and lateral travel of the fire in the roof void was confined due to the quick actions of the Fire Department. No civilians or firefighters were injured as a result of the incident. The building was turned over to the owner after the termination of this incident. The fire is under investigation at this time by the Spokane Fire Department’s Special Investigation Unit. There was damage to the ceiling and roof surrounding the involved and now destroyed air handling unit. St. Charles Catholic Church is having their 2nd Annual Blue Mass to honor fire, police and all first responders throughout the county in remembrance of those who have fallen and support those who serve. . All are cordially invited to attend the mass on September 11, 2013, a day observed as “World Day of Prayer for Peace”. Everyone, catholic or non-catholic are welcome to attend. The principal celebrant will be His Eminence Blasé Cupich, Bishop of Spokane. The Mass will begin at 0830 on Wednesday September 11, 2013 at St. Charles Church, located at 4515 N. Alberta, Spokane. On Saturday, August 31, 2013 the Spokane Fire Department responded to 4507 N. Adams on a reported structure fire.The first crew on scene was Engine 15, who was returning from a Medical call in the area. Engine 15 reported smoke showing from the roof, and all civilians were out of the structure. Within minutes of arriving, companies successfully stretched multiple hose leads into the structure while search teams crawled through the area to search for victim and fire extensions. The fire was quickly located in a wall by engine companies and interior search teams confirmed that there were no victims. The fire was confined to the second floor, attic, and roof. There were no injuries reported as a result of this incident. Narrative:Spokane City Fire Department was dispatched today at 2:12 PM to a reported structure fire at 1324 E. Heroy. The first arriving apparatus was Engine 15 and the officer reported smoke and flames showing from three sides of a one story wood frame residential structure. E 15 immediately directed hose leads to protect the homes on either side of the burning structure. Other arriving units were assigned to conduct search operations, and assist with extinguishment of the fire. All occupants made it out of the burning structure safely, and there were no injuries to fire personnel. Damage:Fire and smoke damage throughout the structure. 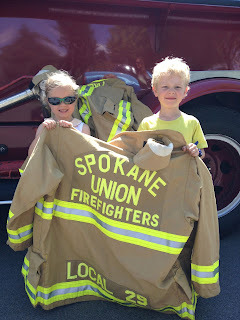 Spokane City Fire Department was dispatched today at 12:53 PM to a reported structure fire at 2331 W. Boone. The first arriving apparatus was Engine 18 and the officer reported smoke showing from the front of a 1.5 story wood frame residential structure. Upon further investigation they found a fire in the attic of the home and initiated an interior fire attack from the second floor stairwell while additional arriving fire crews pulled ceiling from below exposing the burning structural framing rafters. The quick initial interior attack prevented the fire from extending into the 2nd floor living space and the remaining areas of the common attic. The occupants of the home are being supported by our local Red Cross Team. Fire damage was confined to the attic at the rear of the house and the ceiling in the kitchen on the main floor with smoke damage throughout the second floor. There were no injuries to civilians or firefighters. Narrative:On August 13, 2013 at 13:34 PM 6 companies of Spokane Firefighters, 1 Senior Ladder, 4 Engines and 1 heavy rescue under the direction of Battalion Chiefs Donahoe and Moline were dispatched to a reported attic fire in a 4 unit apartment building. Spokane Ladder and Engine 2 from the Logan neighborhood arrived within 4 minutes of being dispatched to find smoke emitting from both gable roof vents of the 2 story apartment building. The responding Chief upgraded the incident at this time to a working fire which brought a dedicated ladder and also called for another engine company to assist with this incident. Companies were assigned to locate and extinguish the fire, search for occupants, water supply and possible roof ventilation. Interior companies quickly located the smoldering fire in the attic of the affected unit and were able to extinguish and prevent further extension to the 3 adjoining units. All the occupants made it out safely and there were no reported injuries to firefighters or civilians. The affected apartment unit is uninhabitable until structural repair can be made to the roof trusses, along with damage to the ceiling and wiring in the attic. One adult occupant is seeking shelter with the Red Cross until the repairs can be made. Cause:The Special Investigation unit has determined that the attic fire was caused by faulty wiring. Damage:Moderate damage to the roof trusses, ceiling assembly and wiring of 2405 N. Cincinnati. No damage was reported to the three other attached Apartments. On Monday July 29, 2013 at 4:25 AM, 5 Companies of Spokane Firefighters, 3 Engines, 1 Heavy Rescue and 1-Senior Ladder under the direction of Battalion Chiefs Moline and Donahoe responded to a reported residential apartment fire at 7723 West State Route 2. The first fire company arrived within just minutes of being dispatched, due to the proximity of the Station 6 to the apartment units located in the newly annexed area on the West Plains. As Engine 6 arrived they reported a large amount of fire and heavy smoke showing from the two-story apartment building complex and almost immediately requested the incident to be upgraded to a working fire. The initial companies were faced with a rapidly escalating fire that had begun to spread to other areas of the building and had already vented through the roof. Without knowing the status of residents and fearing for multiple rescues from occupied adjacent units, a second alarm was requested at 4:33 AM with a special request for two ambulances with an AMR Supervisor. The sheer numbers of firefighters needed to force entry, search, ventilate and suppress the fire from the second floor eventually led to a third alarm being requested at 5:11 AM. The incident commander's tactics combined with aggressive firefighting were successful in containing the fire to the primary area of origin while simultaneously protecting the safe egress for occupants. Fifteen citizens occupied the wing of the apartment building affected by the fire and were all accounted for and escaped safely (some with firefighter assistance). Five occupants lived in the unit of origin (2 adults and 3 children): Three of those were evaluated by Paramedics for injuries but none were transported by ambulance. It took just over an hour for the 45+ firefighters to confine and extinguished the blaze and limit loss for the occupants. Cause:The cause is under investigation by the SFD’s SIU and the American Red Cross is assisting the displaced occupants. Damage:The majority of the 16-unit apartment complex was saved and damage was limited primarily to two units. Firefighters are expected to remain on-scene all morning protecting the homeowners belongings from additional damage during the salvage and overhaul operations.